......is now up and running. See all the details HERE or click on the Monthly competitions page on the left hand side. 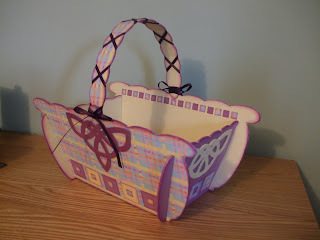 Leann made the basket to match the card you can see, what a fab combination. 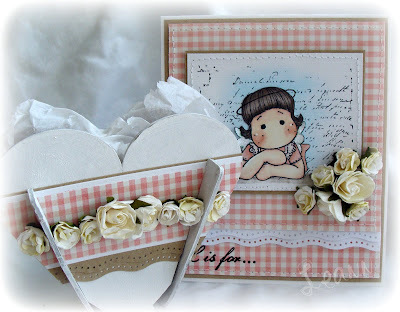 We will hopefully be featuring more of Leann's creations sometime soon. Oh I just love this basket!!! Its really sturdy and its sooo big!!!! The top measures 8x6 inches so you can get lots in it. Below I have put some daffodils in it. Yes...the base is strong enough to take the weight of the wire mesh & the water in the tub (I found that an old take-away tub fitted perfectly haha). As you can see I am no flower arranger as there should have been some greenery in there too! 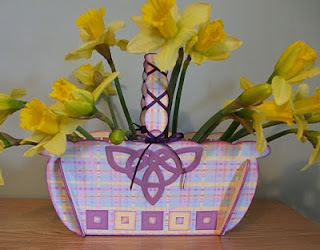 The basket just slots together & there is no need for glue as it stays put! Check out the new link on the left hand side.....now blogger lets us add pages, such a cool feature. There will be Tando goodies up for grabs every month, the first competition will be announced soon. Now for something completely different...well I haven't seen these before haha. 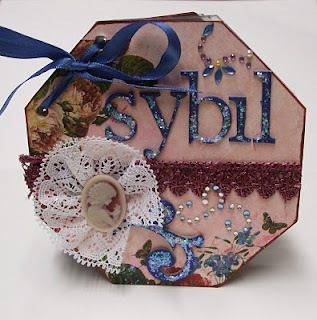 Its Karen here and I have been working with a little octagonal book (107x107mm) with a difference. All the pages are self-laminating and very easy to use. The possibilities are endless with these pages. I made a little book in honour of my late mother-in-law, Sybil. I chose to have the ties up near the top rather than the side for a change. As always this lovely quality chipboard can take all you throw at it. 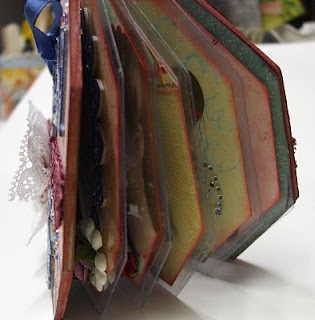 I used Websters Pages (mini book) throughout, cutting some of the pretty patterns to add in too. 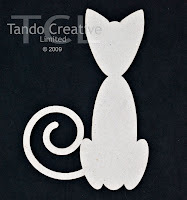 By carefully arranging your paper you can create some pretty effects. 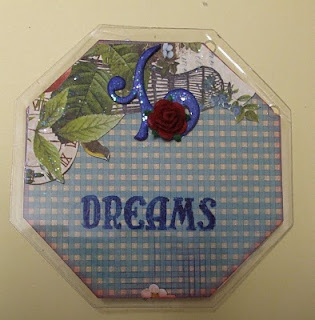 On this page I have put the paper behind the laminating then stamped on top with stazon. mmmm...must check that stamp, the spelling looks off haha! I did try to emboss...big mistake!!!!! 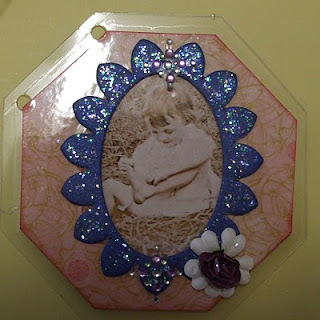 On this one I put the background behind the laminating & then the picture, frame & flower on top. On this one the picture & other papers are behind the laminating with just the scroll, roses & bling on top. On this page some paper is underneath the laminating while some is on the top with the scroll & rose. I stamped the word 'dream' in stazon. 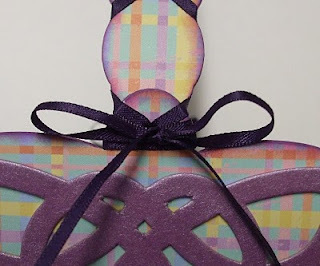 This layering gives a very pretty effect and the paper sticks easily onto the laminate. 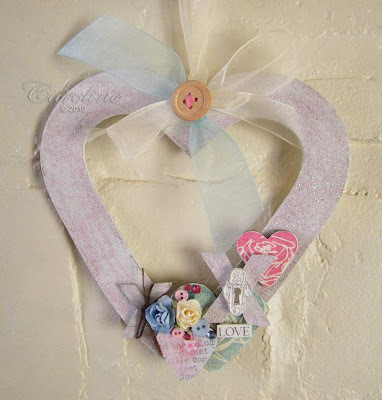 Although St. Valentines Day is behind us now there was definately some lurve in the air and 2 very talented people made these gorgeous hanging hearts. 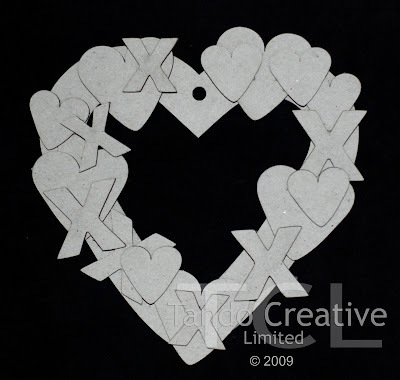 This heart wreath is 140mm x 140mm with a hole for hanging. 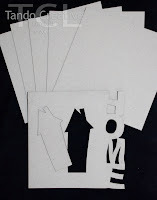 Chipboard elements also included are 5 no. 43mm wide hearts, 6 no. 27mm wide hearts, 4 no. 31mm wide X shapes (kisses) and 3 no. 24mm X shapes. 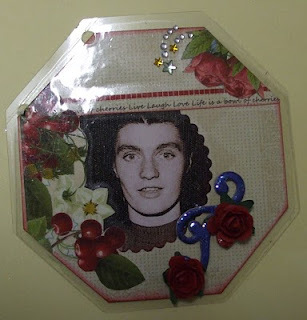 "I covered in white acrylic gesso and then used Stickles on the top of the whole heart and three of the crosses. 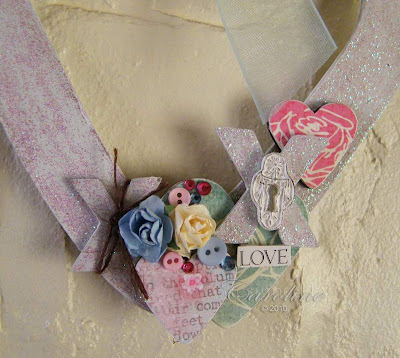 I covered three hearts in Prima paper and clustered together at the bottom of the main heart, together with little flowers, buttons and crystals". Hugs and Kisses Board Competition. Well, midnight last night was the deadline and today I wrote out 5 pieces of paper, each with a number from 1 through to 5 written on it and placed them folded into a bowl. 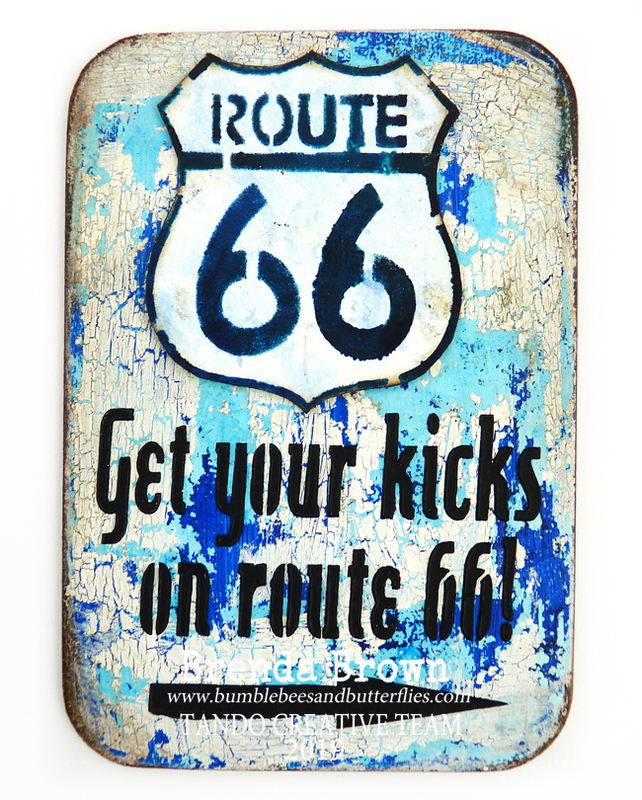 4.....so congratulations to Carol....the board and pieces will be on their way to you asap. Hopefully sometime soon we'll do another competition....you never know, we might double the number of entries LOL!! Hi it's Sharon here - with this project I am either 4 months late or 8 months early! However I am going to opt for 8 months early so I can feel good about being so organised LOL. 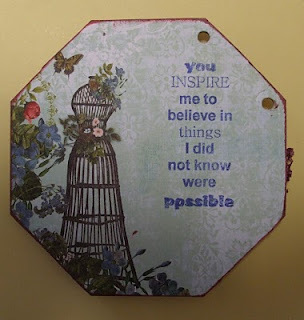 Mind you I often make things out of season just because I feel like it and that is what happened when I received this next piece of chipboard. These cute curly tailed cats come in packs of 2. I used the large one which is approximately 145mm x 95mm. Karen used the small one here. 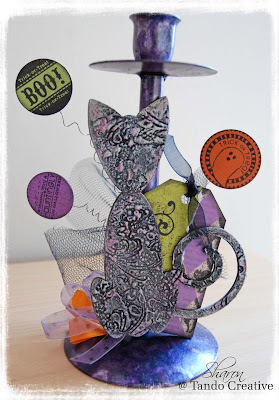 I really wanted to make this cat in to something Halloween themed so chose to decorate a candlestick. To decorate the cat I applied Viva Decor Ferro paste in charcoal and stamped with a Tim Holtz stamp to make the texture. I dried it with a heat gun to also give a bubbled effect. Once dry I painted black paint in to the grooves and then rubbed off the top layer of paint so that the Ferro showed through. I lightly sponged some silver acrylic paint over the top and finished off by rubbing on some pearl grey and berry metallic paints on parts. 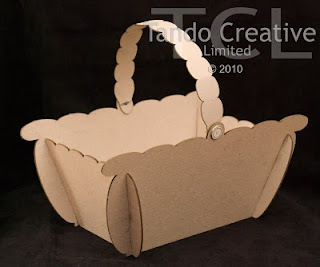 The Tando chipboard is so thick it really does take any medium you put on it! The candlestick was originally black however I coloured it with alcohol inks to make it more purple and mottled. The paper tag is made with Rusty Pickle paper and the circles attached to wire are stamped with Papertrey Ink Halloween Tag stamps and punched out. Just a reminder about the competition peeps.....open to everyone. I will be drawing the winner for this on Monday 15th February so you have about a week to go. 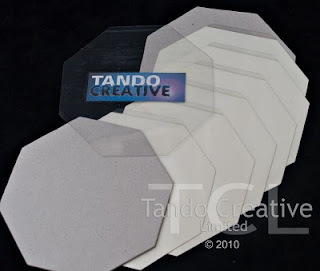 One of the most recent services to be offered by Tando Creative Ltd is Bespoke Word Books. The very talented Caroline has decorated a word book beautifully to showcase this service. The pages are below, you will notice lots of Tando chippie amongst them. This is what Caroline did...."The whole book was covered in acrylic gesso and then painted in a tan coloured acrylic paint. I then sprayed some of the pages with Glimmer Mist, sanded down the edges of the letters back to the chipboard, and then inked with pink ink. 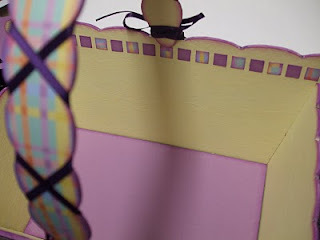 All chipboard used was coloured with the same paint as the book and then embellished". Hi, it's Sharon here. 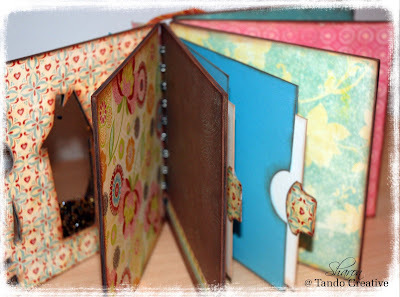 I have a few Tando projects that I am itching to start however I decided to decorate this lovely 6x6" minibook. 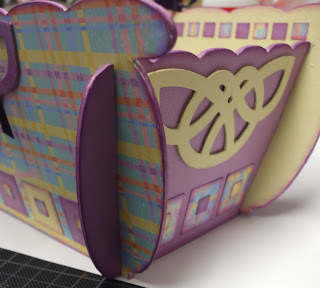 It has a removable house shape and comes complete with 5 additional pages of 6" x 6" chipboard. I wanted to make a shaker feature of the apperture created when the house shape was removed so first I drew around the house window on to a piece of patterned paper and cut out with a craft knife. (I did not glue the cover on at this stage). I then adhered a piece of clear acetate over the apperture on the front of the book taking care to put plenty DST around the house edge. I turned the book over then poured some dedazzle beads in to the shape and adhered another piece of clear acrylic over the back. Once this was secure I covered each side of the cover with patterned paper carefully matching up the house shape that I had cut from the paper earlier. I cut around the edges and letters using a craft knife. The remaining five pages of chipboard were covered with co-ordinating paper. All edges were sanded and inked to finish. I made some extra pockets and tags for the inside of the album. The minibook comes un-punched to give the end user various options for binding. I decided to bind mine with the Bind It All and 1.25" wires as I wanted to make use of the wires for decoration. I covered the chipboard house with paper, added a rub-on, punched a hole in the roof and attached it to the wires with a ball chain. I have not decided on photos for the album yet but when it has been filled I will post some more pictures. This book would also make an ideal gift for someone that has moved to a new home. Papers used are from the Wild Raspeberry Collection by K and Co.
Hello, its Karen here! I hope you have all had a chance to look at the Competition that we have going till 14th February...its an AMAZING prize...look...HERE! Today I am showing you a word...just a little one but very important! Its the word 'us'. It evokes images of sharing & caring doesn't it? Perfect for using on a layout or on a cover of a little book! Of course with Valentines Day coming up it can be ideal! 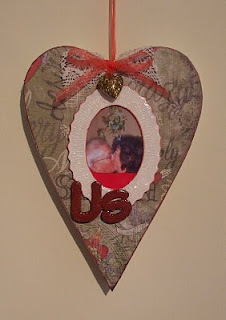 I used a large wooden heart which was a lucky charity shop find...always worth checking these places out I think. I covered it with some romantic paper by Creative Imaginations. The word was painted red and then crackle accents applied. The chippie frame is from my own stash & painted off white & CA added. The photo is a sneaky pic my daughter took on Christmas Day but I love it!!! 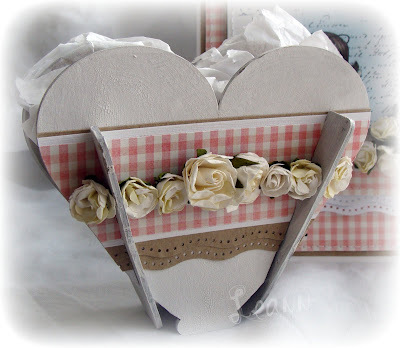 I then added ribbon, lace & a lovely chunky heart charm to the top.